This trail commences at the gate on the Gibson Pass road (west end of Strawberry Flats). Although rated as fairly strenuous, sections of it are quite easy and the going does not get difficult. This is a pleasant day hike for a family or a nice jaunt for the quicker hiker. For the most part the trail is a fire access road. The trail is level for about .5 km and then gradually starts to climb. At .8km there is a creek, but the remainder of the hike to the lake will be dry. At 1km Red Mountain is visible through the Lodgepole Pine. The trail gradually veers away from Gibson Pass Road and climbs more steeply to the ski hill. Once you reach the ski run area (just before the orange chair) the route varies. Hikers go to the left and cross under the chair lift; cyclists and those on horseback stay to the right keeping on the fire access road which makes several switch backs and comes out at the top of the orange chair then continues to the 4.5 km point where the two routes join. Hiking Route: After crossing under the orange chair, you will come to the start of the switchbacks and a trail sign (2.5 km). Looking to the south, while you are crossing over to these switchbacks, you will have a good view of Nepopekum Falls. These falls are quite spectacular in the late spring and early summer during the run-off of melting snow. Step over the creek bed, which is dry in the summer but full of water in spring and early summer, to begin the most strenuous part of the climb. As you reach the 3 km mark, the trail leads into an extensive forest burn area. During the mid 1940’s a number of fires occurred in E. C. Manning Park. The results of these burn areas are usually spectacular displays of wildflower meadows and a luxuriant growth of berry shrubs. The switchbacks eventually take you north and west almost to the top of the ski hill (4 km). A further .5 km will bring you out along the Horseshoe run of the orange chair. The trail levels out here and maintains gentle rolling ascents and descents. Once you cross over the ski run you leave the ski hill area. There is an area map signposted here (4.5 km). From this point, the trail heads west and you gradually make your way across the shoulder of Bojo Mountain. If you look north at about the 5.6 km point you will be seeing the Subalpine Meadow area and First Brother Mountain. 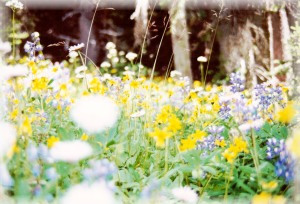 A meadow area with a nice display of alpine wildflowers is reached at about 6.4 km. Another 300 m further you will catch a great view of Red Mountain with the Cascade Mountain Range in the background. Lonegoat Mountain is also clearly defined - look for the cirque. The distinctive shape of Mt. Hozameen won’t be missed as it sits between Red and Lonegoat Mountains. As you near Poland Lake, the first toilet is reached at 7.5 km. A further .5 km brings you to good creek water and then the lake. NOTE: Cyclists and horses are only permitted to travel to the end of the road. The trail to the left, around the south side of the lake, is the fisherman’s route. This tends to be wet and marshy early in the season and usually has a few windfalls. The route to the right, on the north side, is the regular path and is usually fairly dry but you can come across wet sections once you reach the far end of the lake. A wilderness shelter and a set of pit toilets are located at the far end of the lake along with a creek which flows into the lake. Poland Lake freezes over in the winter and does not thaw out until early July. The spring flower bloom often occurs later here than up in the subalpine meadows so it is an opportunity to see spring flowers that are often otherwise missed. Although this trail primarily skirts along side the mountains and not through large meadow areas, there are incredible floral displays throughout the route. The spreading phlox is especially outstanding. This trail is highly recommended based on beautiful scenery, a diverse and abundant show of flowers and its relative ease. Return to E. C. Manning Provincial Park.